Ospreys defence coach Brad Davis has praised the impact of "world-class" Shaun Edwards on the Welsh region. 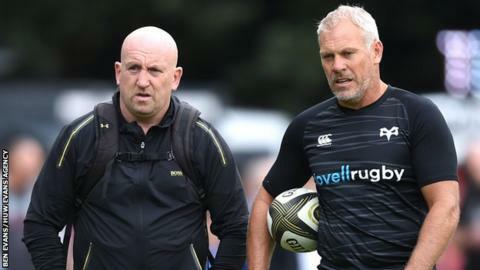 Wales defence coach Edwards, who will return to rugby league to coach Wigan after the 2019 World Cup, is working part-time with Ospreys this season. "We've dovetailed well together as coaches... and I've really enjoyed it," Davis said. "He's a world-class defence coach. I've been coaching at [English] Premiership and Pro14 level for the last 12 seasons, so I've got a certain amount of experience. "But when you're able to tap into the mind of an international, British and Irish Lions defence coach and watch him go to work - even if it is only for one day a week - you're always picking up things and learning." Davis, 50, who like Edwards is a former rugby league player, joined Ospreys in May 2016 from Wasps, having previously coached at Villeneuve and Castleford Tigers rugby league clubs and Bath. "Shaun coming in, I think us having similar backgrounds in terms of our rugby league background - we see the game the same way," Davis continued. "We obviously looked at the way we defended last season and there were some pretty clear-cut areas where I'm sure not only we could see, but our supporters could see that improvements needed to be made. We've applied that. "As a coaching group, especially with [backs coach] Matty Sherratt, Shaun and myself, we've really dovetailed nicely together. "It's very early days and we've had two home games, which makes your start to the season a little bit easier." Australian Davis admits that there was early interest from England when head coach Eddie Jones was seeking a replacement for Harlequins-bound Paul Gustard, although nothing materialised. "That was a possibility. I was shortlisted for the role and I was spoken to about it briefly but, as it panned out, I'm committed to the Ospreys and the contract," Davis added. "At some stage in every coach's career, you'll want to test yourself at international level and I'm no different." Ospreys will attempt to keep their Pro14 unbeaten run intact when they make the trip to Munster on Friday, 14 September.